This is such a major collection that it is getting broken into parts. There are eight holiday colors (that I actually love. Weird) plus two others that I have been hinting about since last week. I have to say. before we get on to the swatches, that every single collection from Melodee gets better. I feel exceedingly privileged to have been invited to be a small part of it...shush, it's the holidays and I'm feeling mushy. Guys. This collection. Wow. That is pretty much all I have. Wow. I'm gonna try and keep the swatches to a minimum...because I could seriously go on forever. I took over 200 photos of eight colors. If I tried to post them all, I would probably break the internet. On a srs note, you will notice that the bottles are smaller (and squarer) than they used to be. I have been told that the prices have been adjusted accordingly. Honestly, I like the square bottles if for no other reason than I can fit more bottles in a drawer. It soothes the nutty housewife in me. Do you want a perfectly perfect holiday polish? Because this is how you do a perfectly perfect holiday polish. Jing-a-Ling is a white cream with red, white, and green glitters of all types. I used two coats plus topper and it was magic. My kids have decided that this is what they will be wearing on Christmas. This one is a repromote, and it is just as fabulous as it has always been. 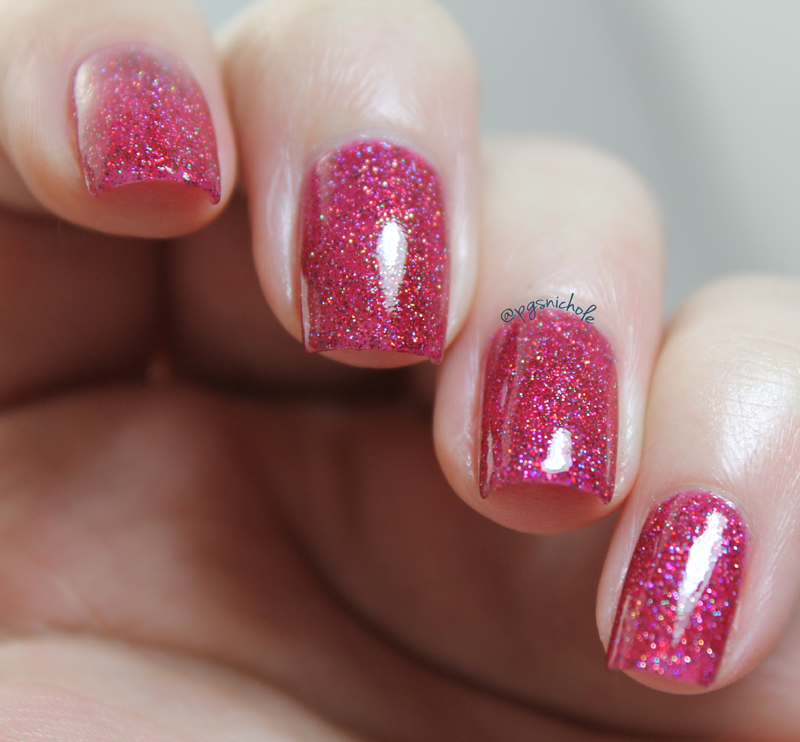 I think this would be a great transitional manicure from Christmas into Valentine's. I needed two coats plus topper, and it behaved wonderfully. This one is one of the original colors that made me fall in love with this brand. This one is described as a textured red/green/silver sparkler. And it is ok as a textured polish. Not super "pixiedustomggetitoff" textured, thank the heavens...just a nice little variation. But when you apply a top coat sammich...unf. Seriously. It glows. Even the husband said "wow" when I was wearing it. I think this is the best cranberry shade I have seen/touched in a long time. It is a luminous, magical jelly...yet somehow opaque enough at two coats to be totally wearable. If you want something quick-yet-showstopping you should definitely grab this one. Teehee. 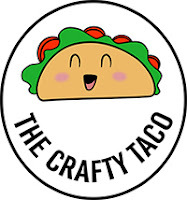 I love the name. LOVE. This definitely made me think of the Grinch. And trees. And holidays. Yes. Perfect. There are lovely bits of green, gold, red, magic glitters in here...plus some holo glitter for good measure. Like Kissing Santa, it has the possibility to be worn either as a textured polish of with topper. I used two coats below, and I think it is perfect. You might actually see some "Christmas" nail art out of me this year...maybe. 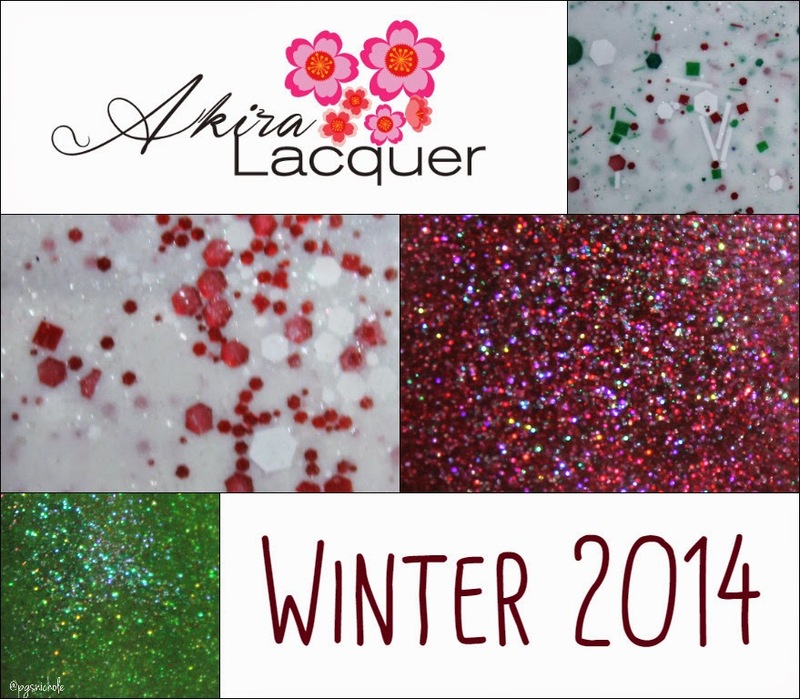 Melodee over at Akira Lacquer has really outdone herself this time. 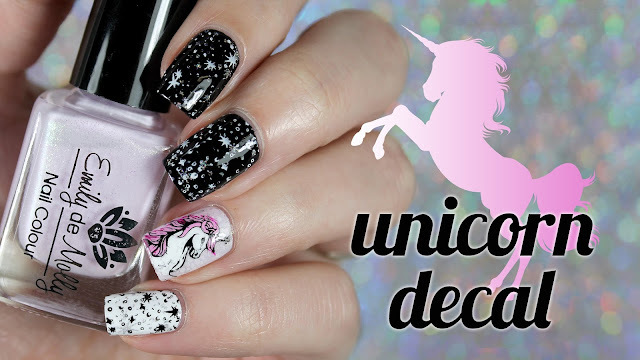 These are some amazingly fabulous and unique polishes. And you should definitely be checking her out this weekend. There will be sales...oh yes. There will be sales. And if you are still here (and not at her shop) check back later this afternoon for the rest of the holiday swatches!